Few other umpires organisers guests and spectators i.e. Ashok Sharma, Krishan Sharma, Martin Meyer, Bashir Ahmed, Harry Darnhofer etc. Umpires are being instructed how to conduct matches during the World Championship. Secy. General: Not coins, Carrommen! women. Women are always discriminated. Even Carrom should be men`s monopoly. Kidwai: Should we call them Carromwomen? Secy. General: No, no, you cannot change it. The term is given by the ICF Congress at Male. The decision is final. You may bring amendment in the Laws of Carrom , in the next Congress. Sheila Devi: Sir, you always make changes, discriminating the women. That is why there are very few top women players. Kidwai: Sheila Devi, we have Queen in Carrom. We don?t have King, or Maharaja. Sheila Devi: Even that too seems to be too much for you. Secy. General: Please don?t give such colour. Don?t fight. Anil Kumar: Sir, you may call man, woman, Mr., Mrs., Lord , lady, Monsieur, Femme, Mademoiselle,Khatoon, Janab, Srimati, Sriman ??.. Whatever you may like. But my question was different. I simply wanted to know if a player has pocketed all his Mr or Mrs, Sri or Sriman why dont you call it century any more? Secy. General: No, no, no, not Century, not hundred. It is slam. Secy. General: No, no, not Royal or Grand Slam. Days of Maharajas and kings have gone. It is simply White Slam and Black Slam. You should not create confusion. Have you not passed the International Umpires Examination? Look you are umpire, umpire. Arn t you ? Your task is umpiring according to the Rules of the I.C.F. and not to argue. Kidwai: We had a game of 29 points. There was no limit of boards. The Queen had 5 points. She was counted up to 23 points. Secy General: But in those days International Tournaments were not taking place. Sheila Devi: We still give 5 points for pocketing Queen. Queen is reduced to 3 points only. Secy. General: Sheila Devi, you are International Umpire. You must know the new Rules! Sheila Devi: How do I know Sir, you are changing the rules every day. Anil Kumar: The game is losing the charm. In our days, when I was U.P. Champion, players were not allowed to hit the opponent s coin, I mean Carrommen, directly. Nor you could hit directly if the piece was on your base line or under base line or on the arrow of your side. That was the game. That was the art. Now you have made it so easy. You have even permitted thumbing. Bachchon ka khel kardiya hai. ( You have made it a children`s game). And you want to make it an Olympic game. Secy. General: OK. Mr. Kumar, then show me if you can easily pocket such Carromman. I am putting it under your baseline near the border. Now try. And now I will show you how difficult but nice shots are possible by thumbing also. to start. You have come here from different parts of India to conduct the matches. Players from Sri Lanka, Maldives, Germany, Switzerland, Holland and India will be here, in this Indira Gandhi Indoor Stadium. And you are fighting on Rules, ...if the Carrommen are male or female. Kidwai: Take them as common. Call them as persons. Afterall terms such as Spokesperson are very common these days. You are International Umpires, Referees for the World Championship. 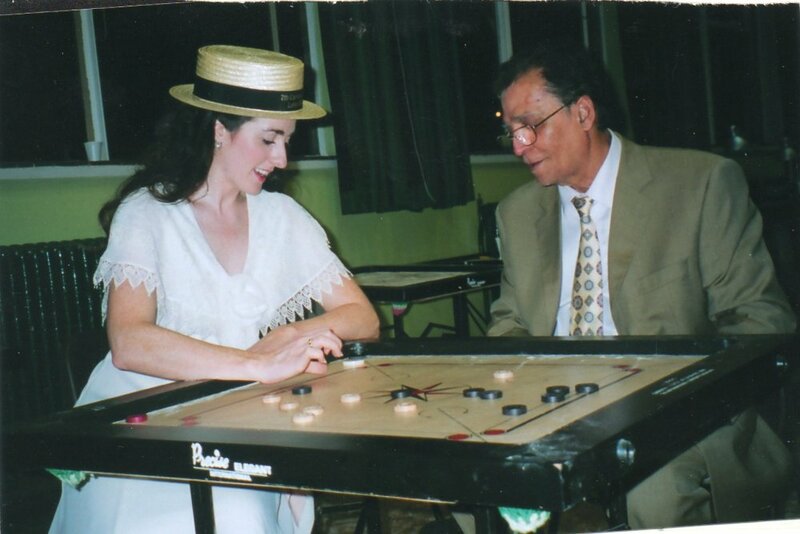 You are the most important Umpires in the history of Carrom. You will be officiating the matches in the First World Championship. Anil Kumar: OK. Sir, but now let us play Carrom. We have been discussing the whole day. During the World Championship we will have no chance. We will have to watch others playing. Let us atleast play today. Sheila Devi: Let us have doubles. Mr. Babu you should be my partner. Anil Kumar: I take Mr. Sharma. Kidwai, you do umpiring. Kidwai: Why should I? You be umpire. Let me play. Anil Kumar: Umpire shall mean an official appointed to supervise and/or control a Match. Chief Referee shall mean mmmmmmmm. Cannon, Cannon, Cannon means placing a C/M ...( as if a Chief Minister )...within the Outer Circle...(Why outer Circle?...Let it be...) near another Carrommen..., (no Carrom man) and or Queen in such a way that there is space and the existing C/M faces the general direction of a pocket. Boy: Daddy, daddy, Mama is calling. We are waiting for lunch! Girl: Papa, you have not taken even breakfast. Mama is making Puri...Come! Anil Kumar: Go, go...I am coming. And look, send Mohan to drycleaning. He should bring my blazer. I need it for umpiring. (Children go back. Anil continues reading the International Laws of Carrom, making gestures. A beautiful woman comes walking, stops near Anil Kumar, puts lipstick on her lips, looks her face in a small mirror and comes closer to Anil Kumar). Woman: Excuse me. What is the time? Anil Kumar: (Without paying much attention) Two (2 O.Clock). Mrs. Kumar: We have been waiting for lunch. The food is now cold. What the hell you are doing here. No breakfast. No lunch. Only siting in the park? Chipu is weeping. you promised her to show film today. Amitabh Bachchan`s film. Children are waiting. Now close this book. Come! and you want to see Amitabh Bachchan. Mrs. Kumar: My God...what a madness! No I am not going without you. Who will drive. Please come soon. We are waiting. (The First Round of the 1st. World Championship is about to finish. Only two players- a German and a Dutch are left in the hall playing on a board. Umpire Anil Kumar is conducting the match. Another referee is assisting with the timer in his hand. Chief Referee is sitting on a distance in front of his desk. Some Carrom officials are watching. Umpire: First Round of the First World Championship. Singles Event. Mr. Ingosoponohloz from Germany and on left Mr? ?.from Netherland. (Umpire asks German player to arrange the C/m for Break. (The German player hits so hard that his striker jumps and falls down on the floor and breaks. The match stops. Umpire goes to Chief Referee and informs him about the incident. Chief Referee: (calls) Manager of the German team! Manager of the German team. Please report immediately. Chief Referee: Your player has broken his striker. Have you another striker? You may give him. Chief Referee: Please get it certified first. One Official: This is heavy Sir, over weight, more that 15 grams. Manager: It can't be over weight. I have bought it here, in Delhi. Official: No Sir, this is fifteen and half gram. It cannot be used in the match. Manager: What the hell? I don?t have another one. Chief Referee: OK. I am giving you my own striker. I am using it for thirty years. Please return it to me immediately after the match. Tell your player not to break it. Manager: Ofcourse you will get it back. asks the player to play. Player: Sir I don?t smell foul. I have not taken alchohl or any drug. I don?t smoke even. Umpire: No, you had the striker in the hand, while placing a penalty c/m. This is foul. OK. Play. Dutch player: (stops) Sir, the penalty C/m is not placed. Umpire: Foul! You didn?t demand before. Now you are disturbing. Umpire: Foul! You have striker over the border of the board. This is not allowed. Dutch player: Sir there is no white in the pockets. ( He takes out his own C/m and shows it to umpire). Umpire: Foul! You cant touch the pockets and cant place a wrong Carromman. German player: Sir, is this correct? Umpire: Yes please.? What you mean? Dutch player: Sir, he says Scheisse! Umpire: Scheisse, Scheisse, Scheisse. What you mean? Dutch player: Scheisse means schit. Umpire: Abusive word. Very bad word. Foul! Secy. General: Mr. Umpire, which board is this? Three hours have gone. Public is gone. It is now 2 O'clock in the morning. The hall is to be closed. In few hours the new round of the matches will be starting. Please try to finish soon. Umpire: First game, first board?! German Manager: Mr. Babu, one should not be so strict. The Rules are new to players. Secy. General: Please don't tell me. I have nothing to do with umpiring. You may officially protest. The protest must be written, signed by Manager or Captain and submitted to the Chief Referee along with fees. 1988. You were one of those who have established it. Your country should give maximum cooperation. Only then we can make it a strong Federation and carrom can become an olympic discipline. This all depends on your cooperation. Therefore please don't argue unnecessarily. Don't be upset. Follow strictly the rules. In Olympics also the rules are followed very strictly. German Manager: My God! Every thing so formal? Anil Kumar: This is World Championship Sir, not a friendly match! Secy. General: (to Umpire) Don't be very strict Mr. Anil Kumar. They are new players. Umpire: Go on playing. Please continue. Umpire: Go on playing. Play, play. Please continue. Umpire. Play. Go on. Continue. Don't stop. German player: Sorry Sir, my striker has fallen into the pocket. Dutch player: I have pocketed my last C/m leaving the Queen on the board. German player: There is no black Carrommen left on the board. (shouts) I have won. Umpire: No black carrommen on the board. Five white Carrommen and queen on the board. India wins against Sri Lanka first board, first game and first match.